I’ll start with a few caveats. I’m a fan of Christian Schneider; I don’t know the ins and outs of this stadium deal in Wisconsin as well as he does; and even if Scott Walker is wrong about the stadium, I don’t think it’s a reason to oppose his presidential bid. With all of that out of the way: I’m not convinced by Schneider’s defense of the deal and especially by his denial that it constitutes using “taxpayer money” to finance a basketball arena. Schneider responds to complaints that Walker is doing a favor for a campaign contributor by noting that many Democrats support the deal too. That’s not much of a defense. 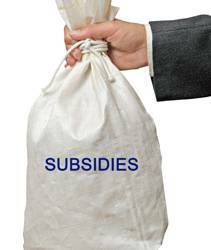 Sometimes government subsidies benefit several businesses, some of whom give to Republicans, some of whom give to Democrats, and some of whom give to both. And sometimes these government subsidies have bipartisan support. Think of the Export-Import Bank, which has become Exhibit A in the case against crony capitalism. will be financed with state tax revenues, but there’s an important catch — the remaining $3.5 million per year the state will pay over the next two decades is more than offset by the annual income taxes the Milwaukee Bucks franchise pays the state. According to state records, the Bucks pay $6.5 million per year in state income taxes. Every NBA player who comes to Milwaukee to face the Bucks pays a portion of his income to Wisconsin. This isn’t expected revenue from future economic development — this is money already being paid to the state. Thus, “taxpayers” won’t be paying the state’s portion, the Bucks will be.